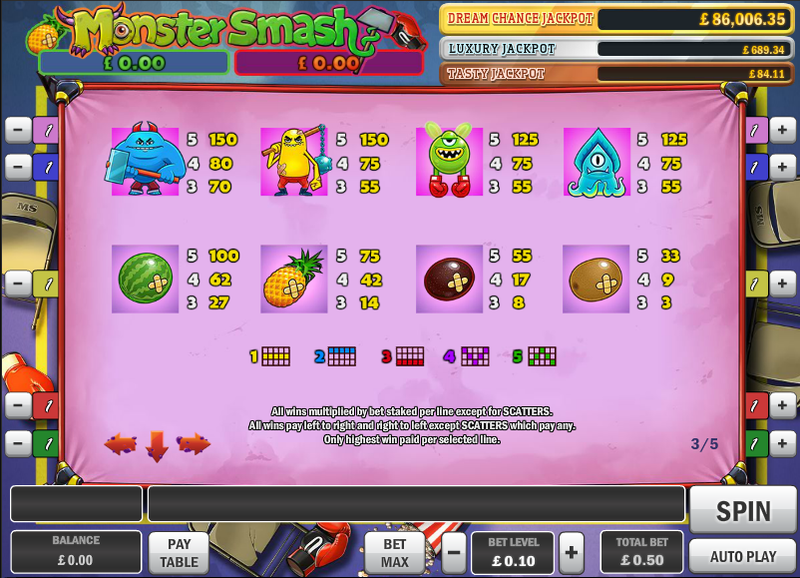 Monsters and fruit don’t often come together in any sort of obvious way but they combine here in this amusing online slot from Play N Go. 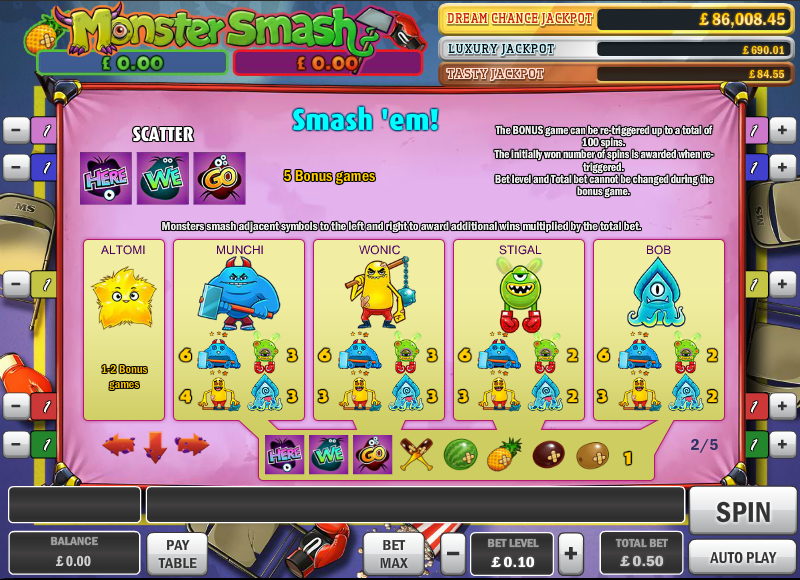 It’s called Monster Smash and although it may look quite simple, it features several bonus features to keep players entertained, not to mention a progressive jackpot. 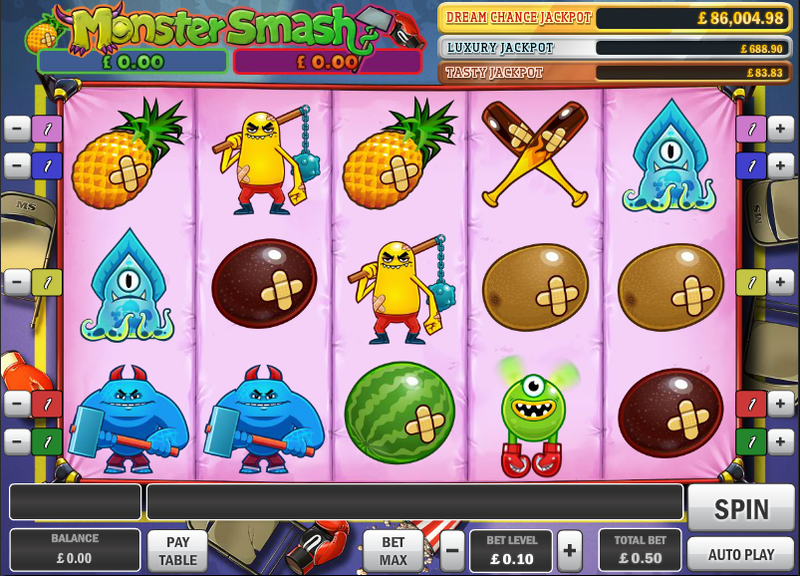 Monster Smash is a five reel game with just five paylines and it’s graphically quite basic but in a sophisticated kind of way; there are four main characters representing the main symbols – Munchi, Wonic, Stigal and Bob – and then four fruits as the lower values – a kiwi fruit, a plum, a pineapple and a watermelon. Special symbols include a pair of baseball bats scatter and then the three ‘Here’ We’ ‘Go’ symbols. Above the reels you will see two boxes containing prize amounts. The one on the left is the Tropical Bonus and the one on the right is the Monster Bonus. These amounts increase when you land wins featuring either monsters or fruit respectively. This is triggered by landing the ‘Here’, ‘We’ and ‘Go’ symbols anywhere on reels one, three and five. You will be awarded ten free spins but then the fun begins – every time a monster lands on the reels he will lash out and hit the symbols to either side of him, earning money. If you can land the Altomi yellow star character on the reels you will receive one or two more spins to add to the total – 100 is the maximum you will be awarded. The jackpot amounts are displayed above the reels. If you’d like to gamble your most recent win you can do so by using the ‘Double Up’ or ‘Triple Up’ buttons under the reels. Here you will play a card picking game with the aim of doubling or tripling that win. Take care with the gamble feature – using it too often is the swift way to deplete your bankroll. This is a really entertaining game with lots going for it; cute characters, lots of bonus and of course that progressive jackpot – give it a spin! It also has a nice high RTP of 97.00%.